On October 17, 1987, Jack Alan Davis, Jr. disappeared. Five days later, his body was found at the bottom of a campus stairwell. By noon the next day, the county coroner announced he drank too much alcohol, passed out and choked to death on his own vomit--not everyone believed him. 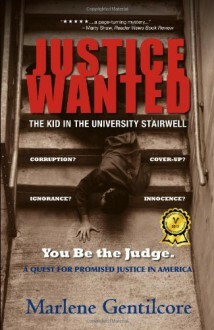 This moving and ultimately redemptive book tells the story of Jack, the student who died at Indiana University of Pennsylvania, of the older brother who was determined to find out how Jack died, and of the tireless reporter who devoted herself to finding justice and truth for Jack's family. The true story takes readers from idyllic campus scenes haunted by images of his senseless and brutal death, to the coroner's examination room, all while questioning how we treat the dead--and how we treat those who survive. As Marlene Gentilcore tells her readers in the final pages of Justice Wanted, Looking back now, I realize that no matter the outcome of our...courageous quest, we have lived the real American dream of fighting for the promise of a nation based on justice for all.